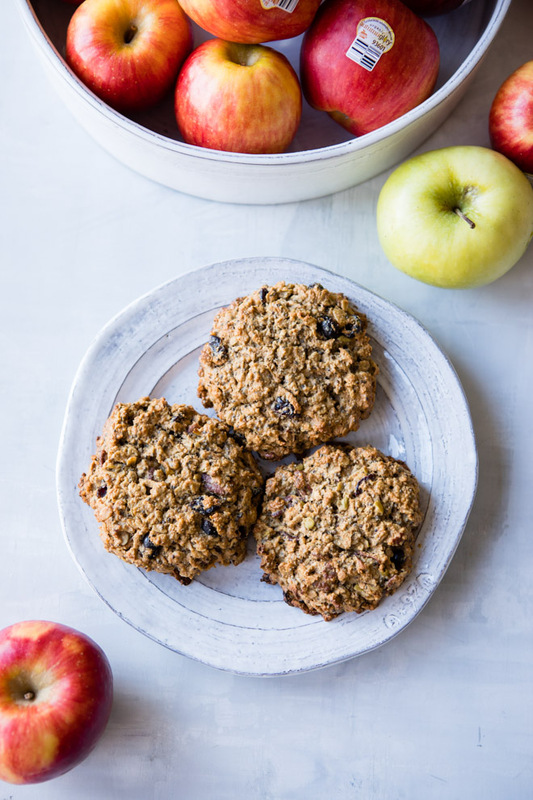 Apple Breakfast Cookies are a powerhouse combo of whole grains, sweet and fiber-rich apples, and nut butter for a wholesome, filling grab-and-go breakfast or snack. 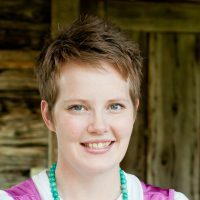 Back in October, I went on a little road trip with my dear friend Kelly. We drove from where I live in Boise, Idaho up to Washington to visit some of the SuperFresh Growers’ apple orchards. We specifically visited one of the Granny Smith orchards and the next day we were up with the sun to visit the Autumn Glory orchard. I’m teaming back up with SuperFresh Growers’ to bring you this recipe for Apple Breakfast Cookies. Awhile back I shared a simple recipe for a Rustic Apple Galette using SuperFresh Growers’ proprietary new apple variety, Autumn Glory. And even though the name sounds like it would only be available during the fall, that’s not the case! 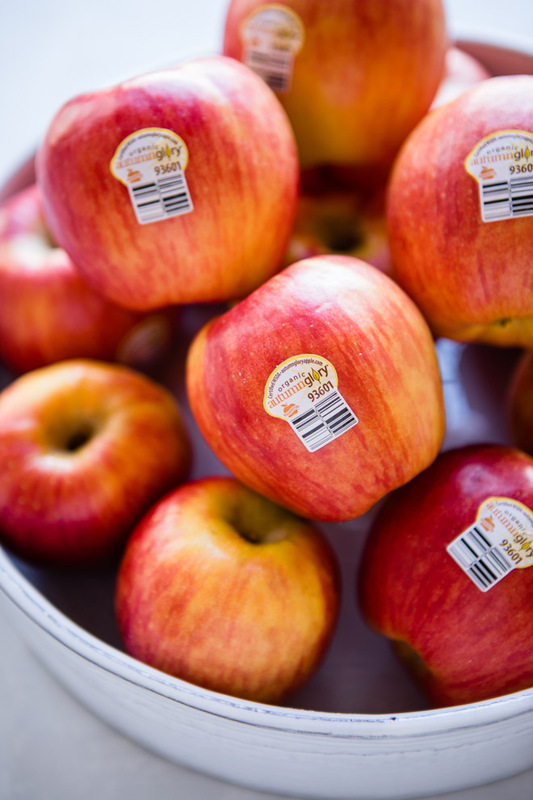 These apples that naturally taste like caramel and cinnamon are available from the late fall through spring. 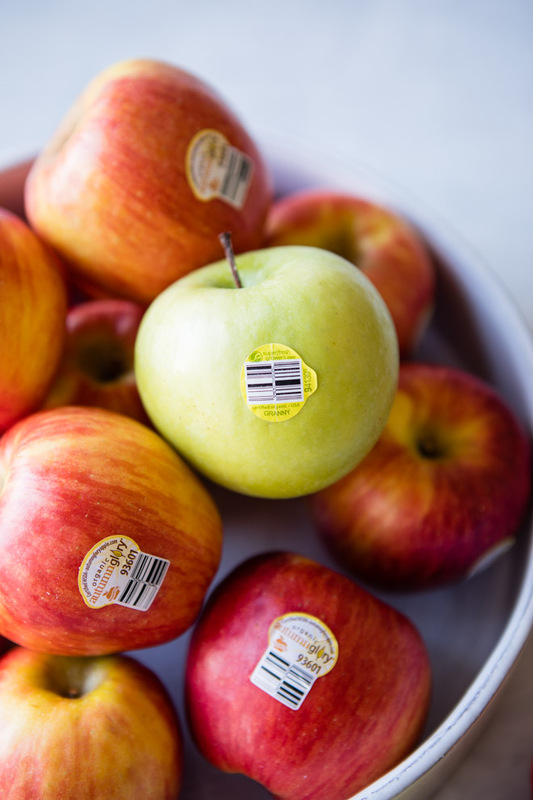 So check out your market’s produce section and grab a bag of Autumn Glory apples! Before Kelly and I hit the road, I tossed a bag of breakfast cookies into the car with us. They’re kind of my favorite thing to keep in my freezer. Those particular cookies were part of recipe testing I did for the new Simple Green Meals cookbook that’s coming out this fall. (Lips sealed! You’ll have to wait for that recipe! You’ll hear a bunch more about it in the months to come. 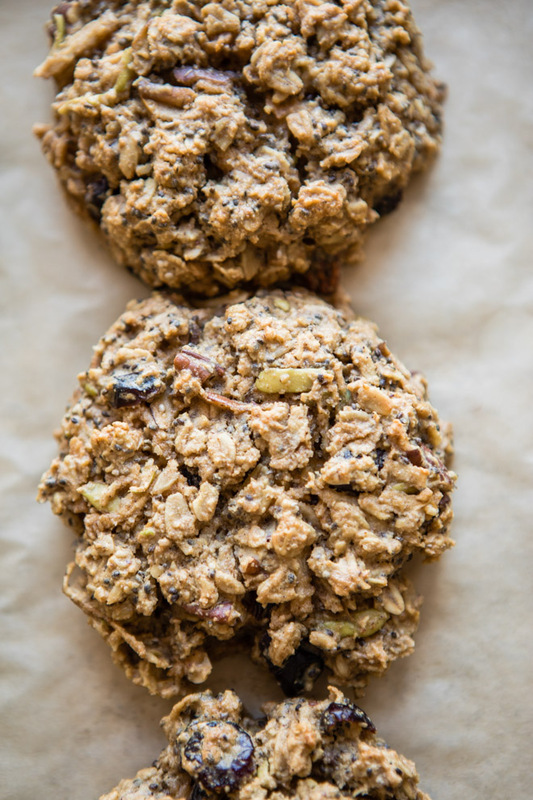 wink, wink) In this breakfast cookie recipe, I use a combination of the sweet and crunchy Autumn Glory apples with another of my favorite, Granny Smith. 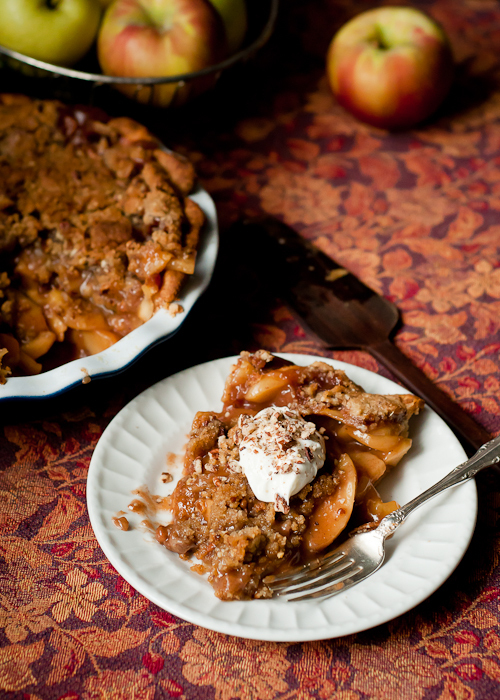 Apples Aren’t Just For Breakfast Cookies! 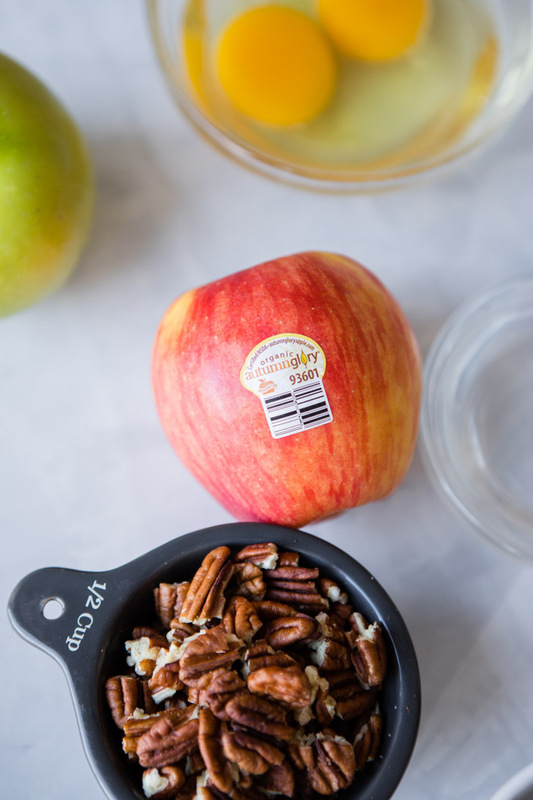 I’ve been using Autumn Glory and Granny Smith apples, along with other varieties just about every day in some way in our family meals. 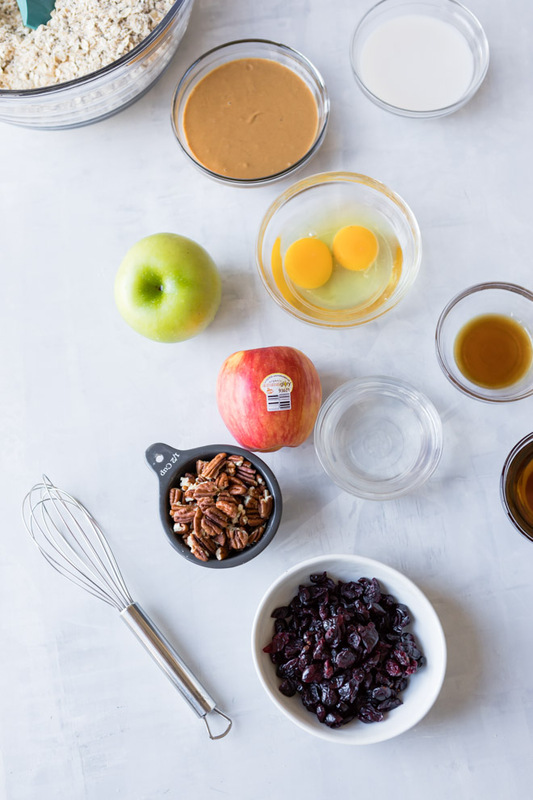 Apples and almond butter are a favorite snack of my whole family. I slice them up to go into salads. I roast or saute them for dinner. And of course, there’s always breakfast! If I’m not adding apples to a smoothie or oatmeal, then they’re going to muffins, cookies, or pancakes. 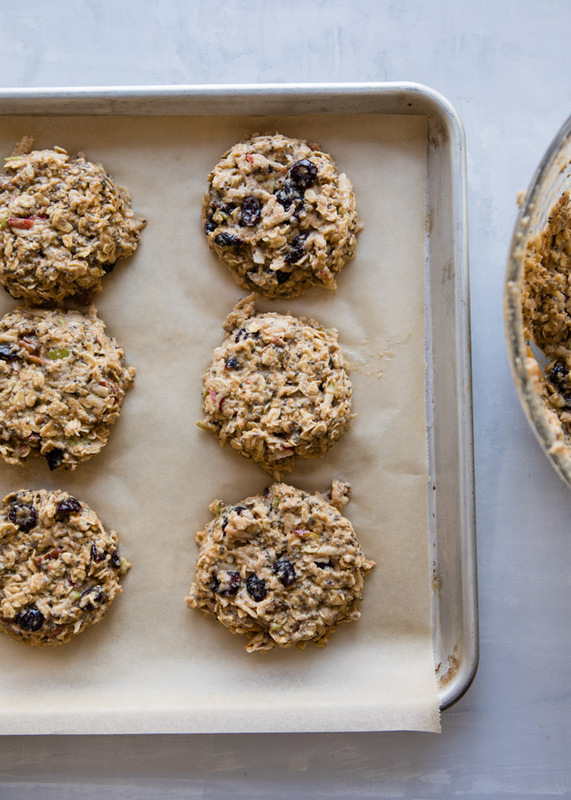 These breakfast cookies are sort of a mash of up of all of my breakfast favorites in one – oatmeal, granola bars, and muffins. They are simply delicious. I love to grab one on my way out the door before a workout and even as a snack later in the day when I’m out running errands. Change ‘Em Up with Variations! 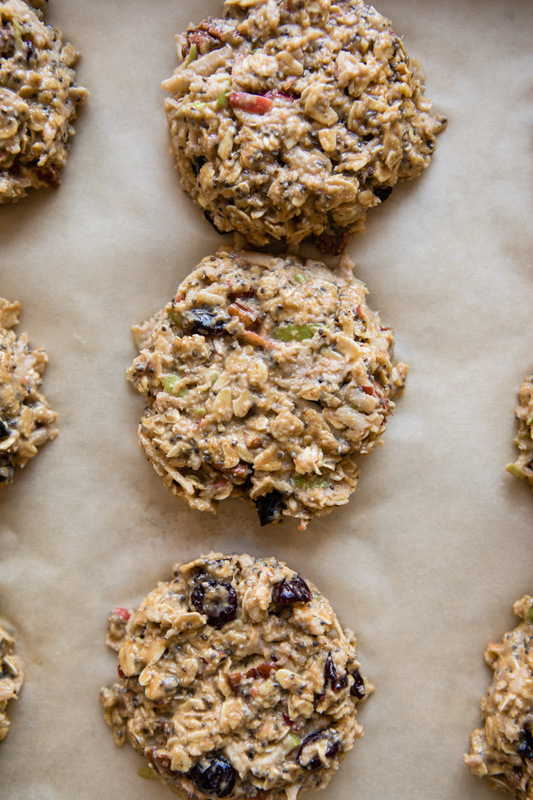 These breakfast cookies are open to many variations. You can easily change them up by varying the variety of apple (you could even add some grated carrots for a carrot cake version! ), nuts, dried fruit, and spices. My favorite combo includes pecans and cranberries. 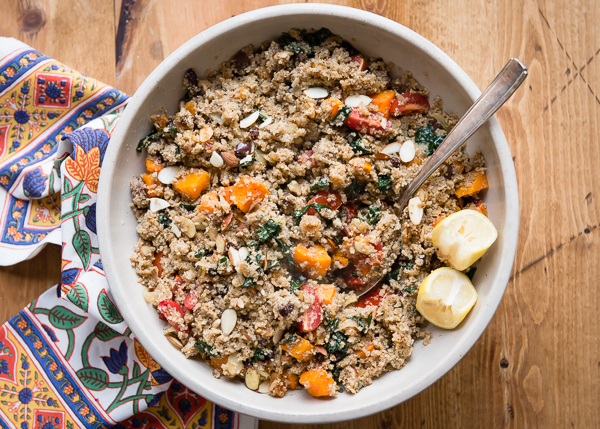 The recipe also calls for plenty of fiber-rich oats, almond flour, and chia seeds. There’s also a good amount of protein and healthy fat to make these filling and satisfying. Make a double batch and freeze them for the month! 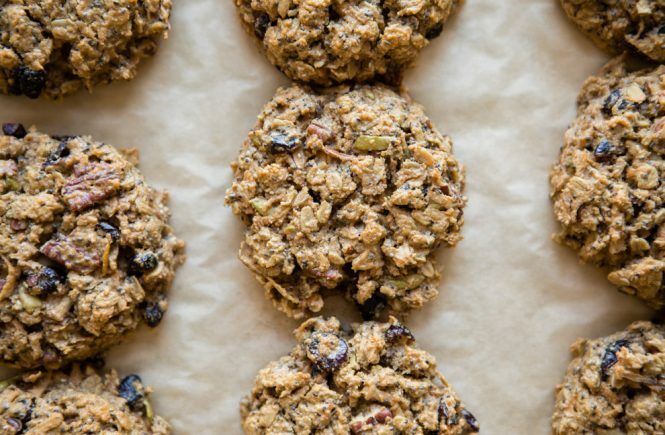 These apple breakfast cookies are full of heart-healthy fiber, healthy fats and omega-3 fatty acids, and sweet, juicy apples. Perfect for an on-the-go breakfast or snack. Preheat oven to 350°F. Line a baking sheet with parchment or a silicone baking mat. Whisk together the wet ingredients. Pour into the dry ingredients. Stir until combined. Fold in the grated apples, pecans, and dried cranberries. Place 12-16 mounds of dough/batter onto the baking sheet. (I use a regular-sized spring loaded ice cream scoop.) Gently press down and shape edges so the cookies are round. Bake for 18-20 minutes, or until cookies are golden around the edges and set in the middle. Allow cookies to cool completely on the baking sheet or they may crumble. When completely cool, transfer to a freezer-proof container or bag and freeze until ready to eat. To reheat, place one cookie on a paper towel or plate in the microwave and heat on 50% power for 30-45 seconds. Or allow to sit at room temperature. 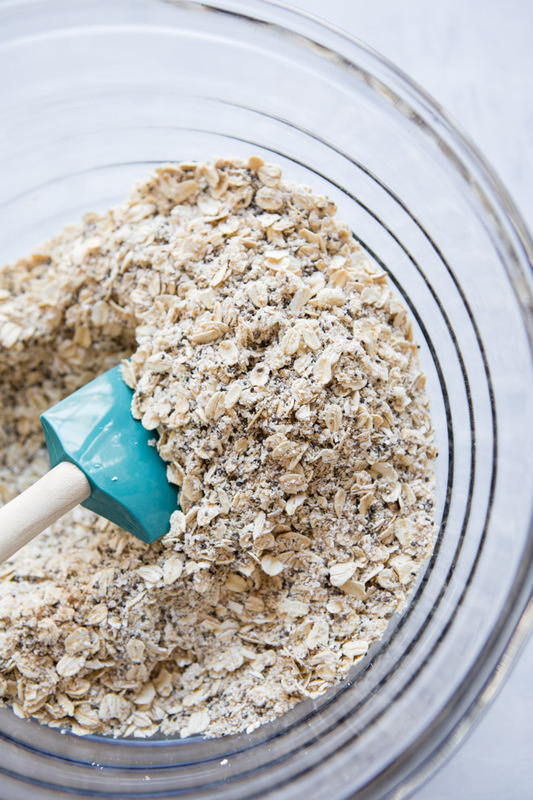 To make a flax egg, combine 1 tablespoon flax meal plus 3 tablespoons water. Mix and let stand until thickened. Use as you would an egg. 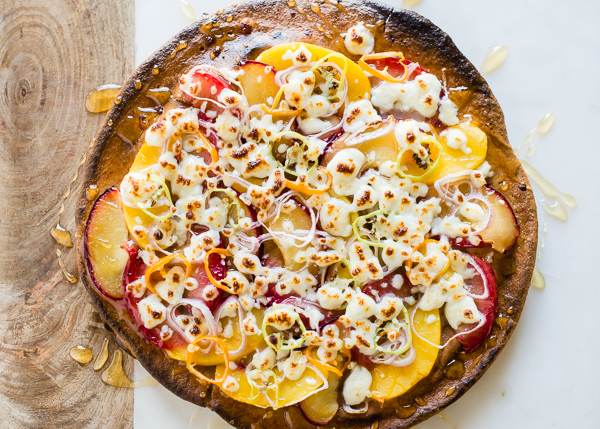 Disclosure: This recipe was created in partnership with Domex SuperFresh Growers. I only recommend brands that I believe in and use regularly in my own kitchen. Thanks for helping support our sponsors! Love that I can eat cookies for breakfast and be good for me! 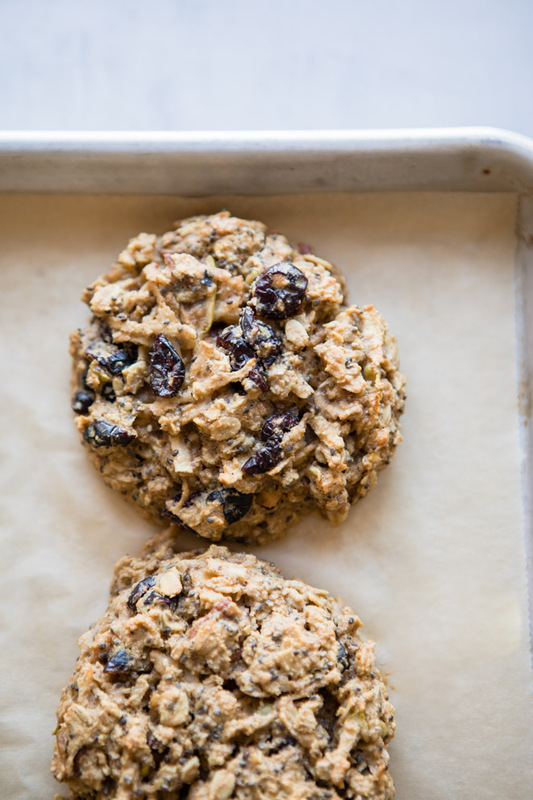 Do you have a biscuit recipe that is nut free? This one looks delicious but nuts are a problem for us. Hello Kay! I’m so sorry that I am only seeing this comment now. Somehow it slipped through the cracks! To make these nut free you could substitute sunflower or another seed butter for the almond butter. And in place of almond flour, you could use ground oat flour or another nut-free flour, except coconut flour. I haven’t experimented with coconut flour in these cookies yet. 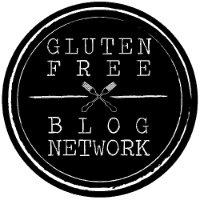 If you are not gluten-free, you could sub whole wheat or unbleached all-purpose flour too. 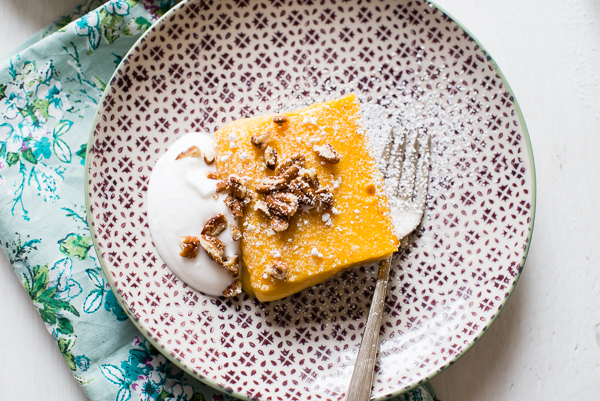 Omit the pecans and use a different nut-free milk. Hope that helps! Ooo, the sweet apples mixed with the spices. 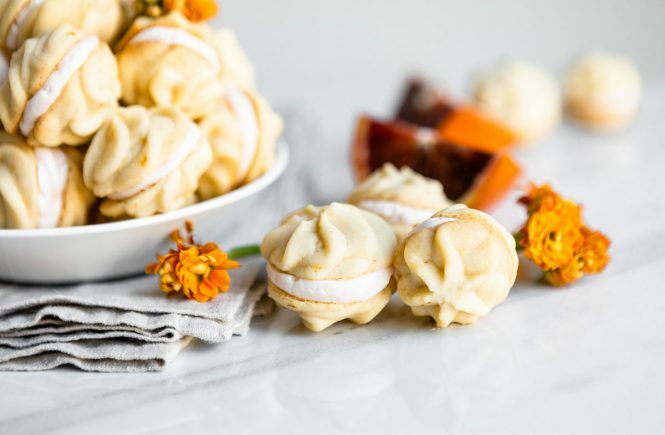 What a perfect fall recipe!! I have to try it, thank you.